Pulsars are highly stable rotators in the universe, rivaling the best atomic clocks on the earth. Thus, they are excellent tools to probe any perturbations in space-time. Pulsar timing is the technique to monitor the rotation of pulsars by precisely measuring the arrival time of their signals at the earth. With this technique, astrophysical effects that influence the arrival time of the pulsar signal, including relativistic orbital motion of pulsars, can be described within the framework of a timing model, and the model parameters can be measured with great precision (see Fig. 1 for an illustration). Fig. 1. Measurements of relativistic effects (advance of periastron, Einstein delay, Shapiro delay, orbital dacay) in the double pulsar system PSR J0737-3039 A/B. Constraints on the masses of the two pulsars from the measurements are shown, where the inset is an expanded view of the region of principal interest. The constraining parameters are shown as pairs of lines, where separations of the lines indicates the measurement uncertainties. 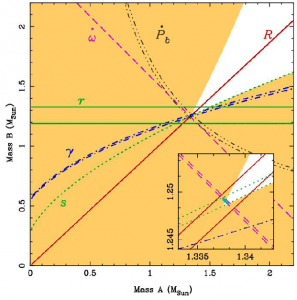 This figure is originally from Kramer et al. 2016, where more descriptions can be found in Fig.1. Precision pulsar timing in the Galactic Centre (GC) is in particular challenging. At low frequencies (<5 GHz) where pulsar timing are typically performed at, the high-density interstellar medium in the GC can greatly smear out the pulsation signals from the pulsars, which is known as scattering. At higher frequencies, the intrinsic strength of the pulsar signals largely decreases as pulsar radio emission usually has a steep spectrum. Therefore, an optimal observing frequency for timing experiment in the GC would lie in between these two constraints (see Fig. 2 for more details). entire line of sight, and the finite number of scintles in the timing data. Scattering is dominated by a region of high plasma density surrounding the GC. We assume a four hour integration time using a 100-meter radio telescope and a one hour integration time using an SKA-like telescope, both with a highest operating frequency of 30\,GHz and a bandwidth of 1~GHz. It is shown that for observing frequencies above 10\,GHz, a timing precision of 100 microsecond can be achieved, in particular with the SKA. See Liu et al. 2012 for more details. Given the large distance from the earth to the GC (approximately 8 kpc), observing and timing GC pulsars require the most sensitive radio telescopes on the ground. 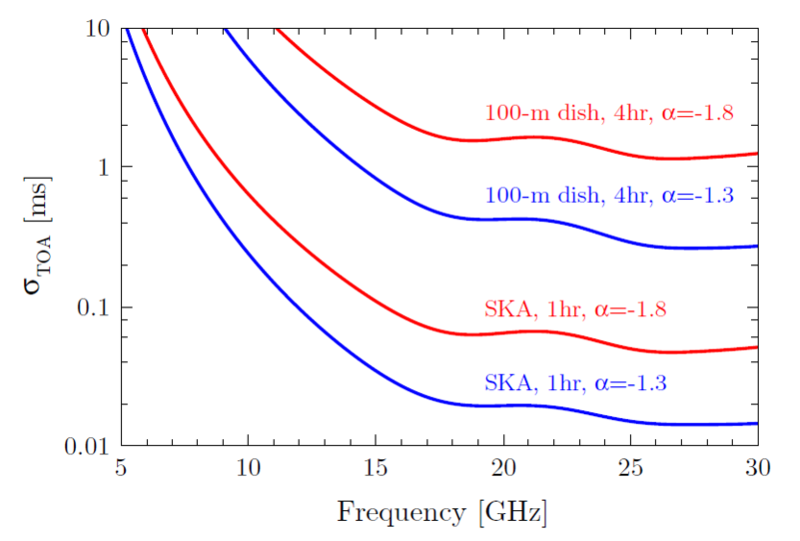 At frequency around 10 GHz, the Square-Kilometre-Array, once available, will provide the highest sensitivity and deliver the capability to achieve timing precision as good as 100 microsecond with GC pulsars. In the mm-wavelength regime, the Atacama-Large-Millimeter-Array in phase-up mode, will be the most powerful instrument for pulsar timing experiment.